The Nintendo Switch bundle will only be available at Walmart. Nintendo unveiled a new Switch bundle today featuring Mario Tennis Aces. Priced at $360 (USD), the Mario Tennis Aces bundle for Nintendo Switch will be exclusively available at Walmart starting September 5. Included in the bundle is a Nintendo Switch with neon blue and red Joy-Con controllers, a Joy-Con Grip, a copy of Mario Tennis Aces, and a full game download of 1-2 Switch. As with most online services, the yearly subscription to Nintendo’s online service is the best value for the price. To get more information about the service, and to sign up, head over the online service’s page on Nintendo’s website. While it’d be nice if the Mario Tennis Aces bundle also included a trial of Nintendo’s online subscription service, the bundle itself is nevertheless a solid bargain. Right now, the Nintendo Switch console retails for around $300 on Amazon, while Mario Tennis Aces is full price at $59.99. Furthermore, the bundle also includes 1-2 Switch which released alongside the Nintendo Switch back in March of 2017. At the time, many buyers felt like 1-2 Switch should have come bundled with the console. 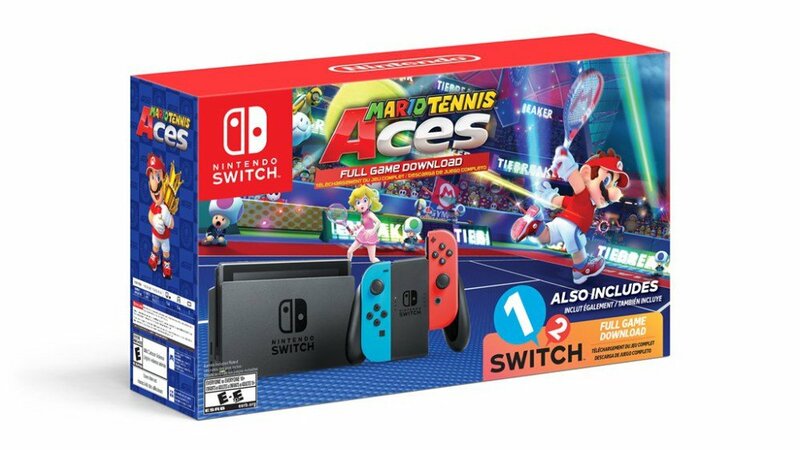 While late, it’s possible that Nintendo may consider including 1-2 Switch in bundles like the Mario Tennis Aces bundle moving forward. While we wait for the release of the Mario Tennis Aces bundle for Nintendo Switch, what are your thoughts? Should Nintendo begin including copies of 1-2 Switch in their bundle for Nintendo Switch? Are you planning on purchasing the Mario Tennis Aces bundle? Let us know down in the comments below!